It is hard to believe that we just wrapped up another week at the Farnborough Air Show! As usual, the show was filled with new technologies, impressive aircrafts, and most importantly, new business opportunities. Each year we reap networking opportunities with existing and potential new customers – giving us the opportunity to meet the decision-makers, shake hands, put faces with names and pursue our strategy goal to supply product on the major aerospace programs. A major part of our strategy when attending an air show is the team we choose to represent Aero Gear. This year our team was comprised of Lee Welch, Director of Sales & Marketing, Richard Haydasz, Sales Manager, and Steve Holhubner, Engineering Manager. While our sales team has attended all of the major shows in the past, this was the first time we decided to bring along an engineer. New technologies are rapidly changing in the industry and it is essential for our customers and potential customers we have the latest technological capabilities. Our engineering team is the core of Aero Gear. Without these well trained capable people, our latest equipment and cutting edge technology would be underutilized in our efforts to meet our customer needs. While we always want to expose customers to our core capabilities, complex carburized/harden ground gears, this year our focus was on promoting our capabilities as a manufacturer, integrator, assembler and test of the several accessory gearboxes we produce. 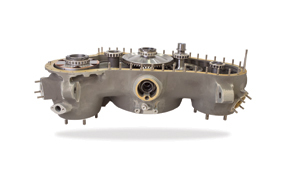 Due to the increase of new engine programs we have recognized that there is limited capability in m any areas of gearbox assembly production. We see the need to emphasize to our existing and potential customers our capabilities and open capacity in the assembly area. We see the need and we are offering a solution. From a professional development standpoint, bringing an Engineer to the show was a no-brainer. When our staff comes to work every day in Windsor, CT – it can be very easy for them to forget that we participate in a massive global industry. Attending a show on this scale puts things back in perspective. We also wanted him to experience firsthand what the Aero Gear sales team does on a regular basis. He was able to interact with prospective customers and understand what technologies and expertise they are looking for. 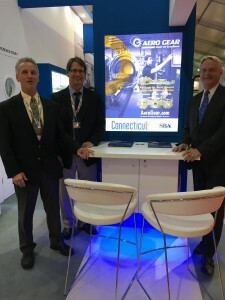 After a long week of hard work meeting the customers, suppliers, competitors and other industry participants, we were glad to make our way back to Connecticut. 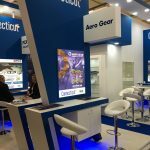 However, there was great satisfaction knowing that the Farnborough Air Show provided us with new leads and new insights in to the future of our industry. 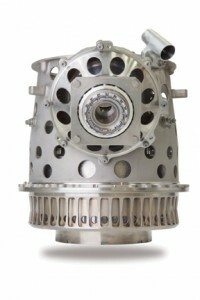 We have returned excited and energized about Aero Gear’s prospects in the dynamic and high tech aerospace industry.